Covetella is Singapore’s premier designer dress rental destination. Their online and in-store showrooms host hundreds of designer dresses and accessories. With so many options available to rent, Covetella is able to fulfil their mission of empowering women by helping them look and feel beautiful while fostering a more sustainable future. One way Covetella helps women look and feel beautiful is through using Marsello to create the Coveted VIP program. Coveted VIPs truly receive the royal treatment when it comes to loyalty rewards. Not only do they receive stars for each rental (1 star for each $1 spent), VIPs are also eligible for exclusive discounts, complimentary fitting sessions with Covetella’s style experts, and invitations to exclusive events – just to name a few perks. Covetella uses a customized Marsello widget to introduce the Coveted VIP program to potential members. This beautifully branded branded widget features the company logo and cuts straight to the main details with only the essential info: a list of rewards VIPs can earn with their loyalty 'stars', Covetella's personalized branding for 'points'. Covetella designed the Coveted VIP program so that VIPs could earn loyalty stars quickly while building a sense of community around the brand. Coveted VIPs can earn stars by renting dresses, writing reviews, and referring friends to the store. They can also earn stars for following and interacting with Covetella on Facebook and Instagram. The widget also clearly explains how many stars customers can accumlate per action, making it easy for customers to see the benefits, sign up and begin earning stars immediately. And Covetella are seeing the benefits too – since creating their loyalty program with Marsello, they have seen a 99% increase in total customer revenue. Covetella strives to empower women by helping them look and feel good. One way Covetella achieves this goal is through complimentary fitting sessions. These fitting sessions take the stress out of dress shopping. For 45 minutes, clients have access to a style expert at Covetella’s in-store showroom who will help them find the perfect ensemble for any occasion. Covetella’s Instagram page is one way the company uses social media to build a community of fashionistas. Unlike other fashion pages, Covetella doesn't just share its newest fashions, their Instagram page is a place to share inspirational quotes and company news, and to feature VIPs wearing their ensembles. With over 14,000 users, they are building a strong community! Carol Chen is quickly becoming an inspiration to female entrepreneurs all over the world as her unique business model gains press coverage. Recently, Covetella won the bronze award for best formal-wear at Expat Living Magazine's (Singapore) Reader’s Choice Awards. 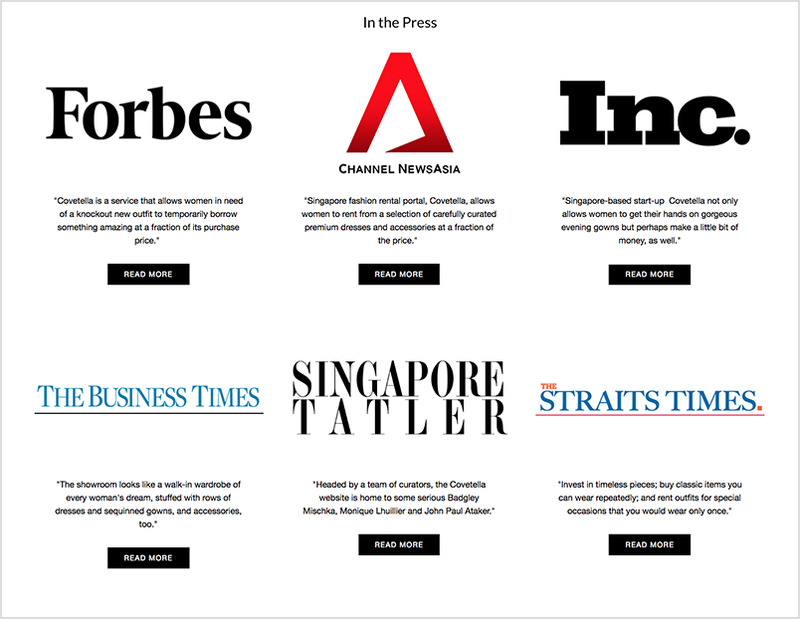 Covetella has also been featured in numerous articles for magazines like Forbes, L’Officiel, The Straits Times, The Business Times, and Her World.